What is the best type of cucumber for making brined pickles? - Canning Homemade! 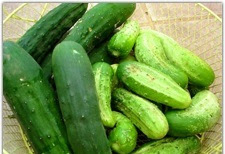 Home » Cucumbers » Pickles » What is the best type of cucumber for making brined pickles? I have had a ton of comments on pickles on my Facebook page and one of the questions is why are my pickles mushy. I want to repost this since one of the reasons could be the type of cucumbers you are using. Cucumbers on Left are "Slicers" on the Right are "Picklers"
The best brined pickles are made from pickling a variety of cucumber picked at the right stage of maturity, not under or overly mature. Cucumbers grown for pickling will yield the best product. The skin is less bitter than slicing cucumbers and they have smaller and fewer seeds. Select firm cucumbers of the appropriate size: about 1 1/2 inches for gherkins and 4 - 5 inches for dills. Picklers tend to get flabbiness in the middle when allowed to get too big. Use odd-shaped and more mature cucumbers for relishes and bread-and-butter style pickles. If you are growing your own cucumbers pick them early in the day to help prevent a bitter flavor. Do not purchase commercially waxed cucumbers for pickling -- acid or salt will not penetrate them properly. You should wash cucumbers, but do not scrub them with a vegetable brush. When prepping them for canning cut off the blossom end since it contains enzymes that may cause softening. As compared to slicers, picklers tend to be shorter, thicker, less regularly shaped, and have bumpy skin with tiny white- or black-dotted spines. They are never waxed. Color can vary from creamy yellow to pale or dark green. Pickling cucumbers are sometimes sold fresh as “Kirby” or “Liberty” cucumbers. When using pickler cucumbers in recipes you will want to extract some of the water so the jars don’t turn out soggy. Cut them into the shape you need, salt them based on your recipe with Kosher or pickling salt, and place them in a colander. For a fast processing let them drain for about a two hours, rinse them thoroughly of the salt then continue with the recipe. Most recipes will call for a salt and ice overnight on the top of the cucumebers. The ice is to keep them cold and crisp. I think that the ice is overkill if you put them in the fridge with a bowl underneath to catch the water that is extracted from the cucumbers. 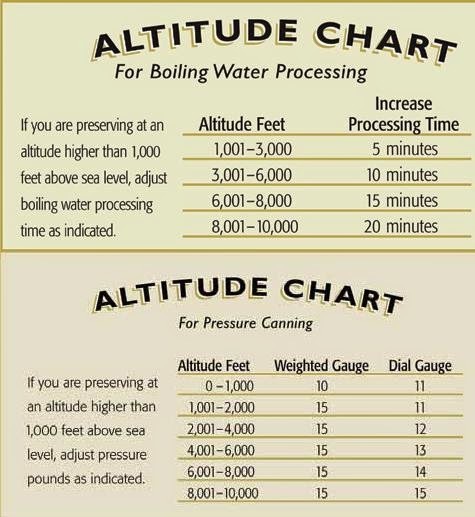 I have done it both ways and find that the ice just adds water not extracts. Just make sure to thoroughly rinse your cucumbers after salting in the colander before you start the canning process. Another way that cucumbers can be mushy is by not measuring exactly the vinegar to water or vinegar to sugar brine that you are using from the recipe. If there is too much vinegar it will break down the cucumber cells and create a mushy pickle. Lastly many people think that the way you cut the cucumber could also have an effect. Try to cut your slices with a mandoline for more uniform slices but if you are like me use your knife and cut them a little thicker too so that the skin will help hold them together better. If you are growing your own “pickling” cucumbers here are the most common and best varieties to work with. • County Fair - Sweet, full flavor, mild, easy to digest, no bitterness Fruit to 3 inches long almost seedless if kept away from other cucumbers. Pickler for chips, spears, whole pickling. Predominately female flowers. Vigorous, strong vines for home gardens. Hybrid. • National Pickling - Solid, crispy. Dark-green, blocky fruit to 5 to 7 inches long, 2½ inches wide; black spines. For sweet and dill pickles. Heavy yield over long season. Early harvest from vigorous vines. Hybrid. • Pickle Bush - Tasty, crisp fruit. Deep-green fruit with pale green stripes to 4½ inches long, 1½ inches across; blocky, classic pickle look. Very productive, compact vines to 2 feet long; suitable for containers. • Regal - Resistant to most diseases. Long, slim shape for pickle chips, spears, whole pickles; good brining quality. Early producing high yields over long season. Gyonecious, mostly female flowers. Excellent for home gardens in all regions. Hybrid. • Saladin - Crisp, tender skinned. For pickling or fresh eating; pick at any stage. Curved, bright-green fruit to about 5 inches long by 1¾ inches wide; small seeds. Good choice for greenhouse growing. European origin. Hybrid. You can also use a variety called a lemon cucumber pictured below. They don't taste at all like lemons, but have a great bright yellow color to their skin. They also have the bumpy skin with tiny white- or black-dotted spines when they grow. Pickled cucumbers are often referred to simply as "pickles" in the United States or "Gherkins" or "Wallies" in the United Kingdom, the latter name being more common in the north of England where it refers to the large vinegar-pickled cucumbers commonly sold in fish & chip shops.